New! Fun and crafty fuzzy cotton linen yarn is very soft and versatile. Can be used in almost all your craft projects. This yarn can be spun, knit, rug hooked, crochet, felted, woven and used to make lovely jewelry. 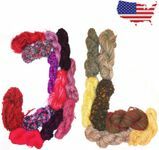 It is super soft direct from India; this yarn is a truly recycled product! It is a bulky weight and is soft and easy to knit or crochet. Suitable for: Scarves, neck warmers, cowls, shawls, stoles, bags, pouches, cushions, embellishment.